PHILADELPHIA, PA – September 24, 2018 – Janney Montgomery Scott LLC (“Janney”), a leading full-service wealth management, financial services, and investment banking firm headquartered in Philadelphia, PA, announced that it has moved into a new office space in Midtown Manhattan, New York. The new Midtown location will be comprised of more than 100 Private Client Group and Capital Markets professionals. The move relocates and consolidates Janney’s two New York City offices on 575 Lexington Avenue in Midtown and One Whitehall Street in Lower Manhattan to a new location at 1166 Avenue of the Americas. Since 2017, Janney has welcomed more than 25 Private Client Group and Capital Markets new hires to its offices in New York City. More than 100 employees will occupy the new Midtown office, which includes 35,000 square feet of newly renovated space. The office tower also includes a newly designed lobby that showcases artwork from notable artists including Roy Lichtenstein and New York City-based street artist KAWS. The location is convenient and accessible for Janney clients and employees with close proximity to Bryant Park, Rockefeller Center, Grand Central Terminal, Times Square/Port Authority and Penn Station. 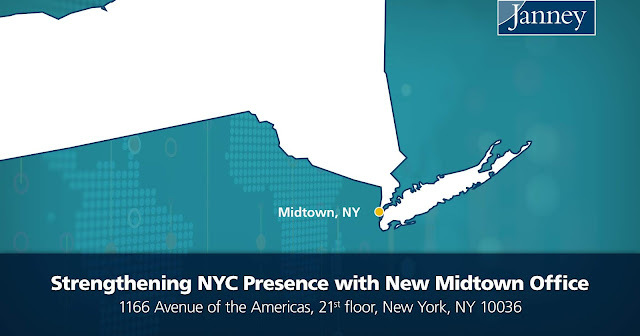 Janney’s new Midtown, NY office is located on 1166 Avenue of Americas, 21st floor, New York, NY 10036.